NASA’s Astronomy Picture of the Day on August 5th 2014 was a picture titled Hadeon Earth. It is a picture of what the planet Earth allegedly looked like four billion years ago. But how does any one know what it looked like back then? Were they there to take this picture? No of course not. It is based on a just-so story. That story is claimed tobe backed by scientific evidence but it is more backed by the faith that the scientists have in science–which really is scientism. Scientism is the belief that science alone can eventually answer all questions, reveal all truth even reveal the unobserved history of our planet back 4 billion years. Explanation: No place on Earth was safe. Four billion years ago, during the Hadean eon [named because of the high surface temperatures like Hell, a biblical reference], our Solar System was a dangerous shooting gallery of large and dangerous rocks and ice chunks. Recent examination of lunar and Earth bombardment data indicate that the entire surface of the Earth underwent piecemeal upheavals, hiding our globe’s ancient geologic history, and creating a battered world with no remaining familiar land masses. The rain of devastation made it difficult for any life to survive, although bacteria that could endure high temperatures had the best chance. Oceans thought to have formed during this epoch would boil away after particularly heavy impacts, only to reform again. The above artist’s illustration depicts how Earth might have looked during this epoch, with circular impact features dotting the daylight side, and hot lava flows visible in the night. One billion years later, in a calmer Solar System, Earth’s first supercontinent formed. Do you see it? Just story telling. Firstly, the writer(s) claim the evidence is from the earth and the moon, but that there remains no land masses that once were part of the planets continental surfaces. So they have to fill in the story. We can’t see it so let’s make up a story around what we observe today. But it must be a story that has a starting assumption that the Universe began in the big bang, when nothing exploded, creating all the energy of the Universe, out of absolutely nothing. Yes, not vacuum energy but nothing, no space, no time, no matter, no energy, nothing. Out of that big bang fireball allegedly matter, electrons, then protons eventually condensed. Then a billion or so years after the big bang stars and galaxies began to form under the action of gravity. This is without a Creator, so the pressure of the heating of those early gas clouds has to be overcome, by some ‘miracle.’ Molecular hydrogen to facilitate cooling of the condensing clouds is not enough so dark matter,1 the ‘god of the gaps,’ had to be invented. More on that another time. Then some of the stars went supernova, exploded and released the products of their nuclear reactions. In those stars it is alleged is where the elements heavier than lithium were created. Those are elements that you and I are made of, i.e. carbon, nitrogen, oxygen, etc. They were then scattered into the interstellar medium. News sites often use the expression ‘it is thought’ or something similar. See here for example. This is typical story telling. Once mankind rejects the creation account of Genesis man is left only with stories and conjectures because he has no access to the past. According to Prof. Stephen Hawking,3 our solar system had to have been created after a supernova because it is plentiful with gold and platinum. That is some of the products, the very heavy elements, that are believed to only be able to form in the high temperatures of a supernova, like gold, platinum and uranium, are found in our solar system. Note the circular reasoning. Theory says these heavy elements only come from high temperature events. Where do you get a high temperature event? In a supernova. Where do we find these heavy elements? In our solar system. Therefore a supernova occurred in the unseen past causing our solar system to form injecting the heavy elements into our solar system. The theory therefore has been ‘successfully’ tested because we discovered a supernova must have occurred forming the heavy elements. It is, at a minimum, begging the question. Earth then eventually condensed out of the dust and rocks left after the sun formed. The pressure of solar radiation drove the remaining dust and the light elements out of the inner solar system. Thus the gas giants formed far from the sun. How do we know that? Because that is what we observe today. More begging I am afraid. What if it was created that way by the Creator? Such am hypothesis is forbidden because it is not naturalistic, and science has been defined as only allowing naturalistic causes. Earth started very hot; lots of volcanic activity and bombardment from all the space rocks attracted to its larger mass. There’s your Hell on Earth phase. But it is just more story telling. As the earth cooled the oceans formed about 3.8 billion years ago, and life crawled out of the oceans. Life must have been a fluke because we now know about abiogenesis — life from non-life is impossible. All of that would be a reasonable story if it did not need so many miracles, and I have not even discussed the origin of the myriad different life forms on planet Earth. If the universe created itself out of nothing (not even the quantum vacuum) why did God claim the credit? And if he created it with the big bang why didn’t he mention something about that in the holy Scriptures? If the creation of the solar system was via a solar nebula and supernova of a star before the sun was created, why didn’t God mention any of this when He revealed to Adam His creation history? ← Cancer in our society V: What would Muhammad do? I’ve been reading the book you wrote with Alex Williams, Dismantling the Big Bang and I had a question. If the Speed Red Shift Theory indicates that galaxies furthest from us are moving at a higher velocity than those closest to us doesn’t that run counter to what we observe in an explosion? In an explosion matter closest to the point of the explosion travels at a higher velocity than matter which is farthest from it. I understand that gravity is a major factor in what we observe in an explosion but does that mean that in a low (or no )gravity environment that matter farthest from the point of the explosion will travel at a higher velocity? For example, has anyone observed matter thrown off from a supernova that indicated that matter farthest from the point of the explosion traveled at a higher velocity than matter closest to it? The mechanics and dynamics of an explosion depend on fluid dynamics, the initial energy of the explosion and the environment the explosion occurs in. The expanding universe concept is quite different and not an explosion at all. The model has it that the universe expands. The galaxies are stationary in the geometry of space, but are dragged apart by the expanding universe. There is also a difference between the expansion of space and the expansion of the universe. 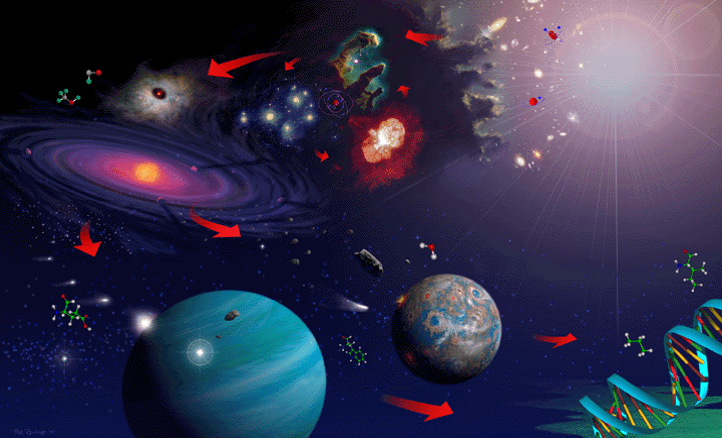 The expansion of the universe could include the concept of expanding space but not visa versa. See EXPANSION OF SPACE – A DARK SCIENCE. So whatever caused the universe to expand determines the outcome of that expansion. It could decelerate due to mutual gravity, coast because the outward acceleration is matched by the inward deceleration, or accelerate due to an unbalanced outward force. But the outward force that created the expansion and the effects of gravity are the only real considerations. It seems to me that the craters on the moon are a major problem to the YEC position are they not? Was the moon (and the other celestial bodies) pre-decorated with craters at birth, or were they made smooth and got totally plastered with craters later on? If later, how could the earth (with ~10 times more surface area than the moon) be missed by such a vast number of unguided missiles that left no patch of the moon unscathed? And how could they all hit their target so successfully after first launch so that whatever their source was now seems empty of missiles (shouldn’t ones that just miss the first time orbit around for thousands of years before another close encounter and chance of hitting?). If they were guided, what agency would be responsible for their creation, launching and guidance, and why for goodness sake?! This is not a subject I have looked at, so let me give two references at this time. How many impact craters should there be on the earth? and Ghost Craters—Evidence of a Young Moon There are several articles on the subject on creation.com and answersingenesis.org that can be sought. These papers are an interesting read! The first paper by Mr Oard suggests that >30,000 impact craters of over 100 km diameter should have formed in rather a short period of time – probably in less than a year to fit in with the flood. Statistically he suggests >100 of these craters would have been over 1000 km in diameter and a few over 4000 km (ie larger than the whole of Australia!). This is an amazing conclusion and I think would fit well with the “Hell on Earth” title. The second paper on “ghost craters” is also very interesting. I was unaware that the “later heavy bombardment” producing the maria filled craters seems to have only affected one face of the moons surface – suggesting that it was all over in a matter of days (or less if the moon was spinning faster – not having then locked to the Earth’s rotation). Dr. Faulkner also argues that the smaller ghost craters (which may be seen within the large maria filled ones), must have also formed in the rather short time between (1) their enclosing large crater being formed and (2) this large crater filling with magma (due to the initial collision cracking the moons crust). He then invokes the principle of “uniformitarianism” to suggest that since the paired large and ghost craters were provably created within very quick succession of each other (astronomically speaking), that very probably the all the rest of the craters were also. However many people are aware that meteoroids come in short intense bunches, and many will have watched comet Shoemaker-Levy collide with Jupiter. Having waited many many years for such an event, in this first direct observation of an extraterrestrial collision between solar system objects we got 21 or more hits in a matter of hours – proving that “uniformitarianism” really cannot be applied to only a small number of collisions! My guess (and it is nothing more than a guess) is that the earlier bombardment was produced by objects which were largely travelling along in a cloud with the earth-moon system and thus accreting less violently onto their surfaces, whereas the late heavy bombardment might have been produced by objects coming from a single scattering event – such as the break-up of the planet which once existed between Mars and Jupiter. This might explain why the later bombardment cracked the crust and produced maria – because these objects came from much further away and were travelling much faster. I found another interesting paper on the topic titled Impact Craters: Alleged Creation Challenge to Biblical Creation. While Mr Oard did not really consider how devastating to life on the planet an impact crater of the sizes he proposed might be, this author considers it far more seriously. So much so that he finds it necessary to argue that there is not a single large impact crater on the earth! (The rather well known ones having other possible explanations such as an extraordinarily large “maars-like” explosions). So one investigator considers it “safe to conclude” that the earth should have 36,000 large impact craters, while another motivated by the same ideology argues that there should be none. I think this indicates a problem, but what the solution might be, who can guess.